And this is with that 2 inch trim/cut last year and about another .5-1 inch trim this year! 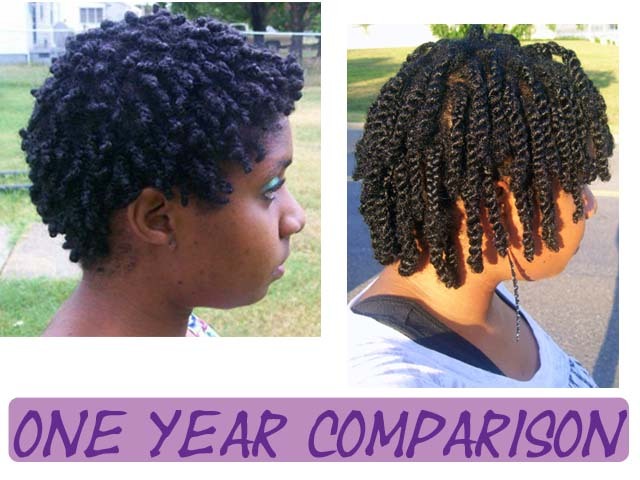 The twists done last year were shrunken and the roots were not braided. The ones from this year were done on stretched hair and the roots are braided. Still great progress I think! Fantabulous growth! When you say this year's twists were stretched as opposed to last year's what did you to stretch them? Thanks love! I washed and conditioned my hair the night before, then I braided my hair up into big sections and let it air dry overnight. Normally I would just go right into twisting after I finish washing my hair without giving my hair time to dry first. Hopefully I will have a video up soon showing exactly how I did that style!